That’s really strange – we’ve had the same problem, although on a smaller scale. I have never in my life seen so many ladybirds in the winter, or indoors at any time of year. Some of the ones I’ve seen have been huge too – there was a 19-spotter the other day that got tangled up in my hair! Thankfully I disentangled it and put it outside none the worse for wear. 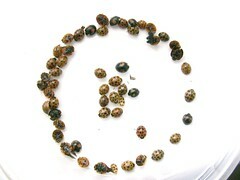 But it is a very odd phenomenon, all these ladybirds. Maybe they’re all searching for blokeybirds to hook up with? I’ve got the same problem – was just about to twitter about it! I think using their dessicated corpses for art is definitely a way forward. It’s global warming telling us “sticking macaroni shells to paper is sooo last century”.